The Boilermaker Special, the Official Mascot of Purdue University, stands parked underneath the Gateway to the Future Arch. 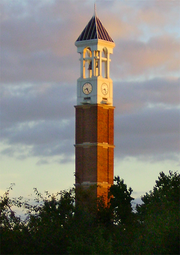 The Boilermaker Special is the official mascot of Purdue University in West Lafayette, Indiana. It resembles a Victorian-era railroad locomotive and is built on a truck chassis. It is operated and maintained by the student members of the Purdue Reamer Club. Contrary to popular belief, the burly boilermaker Purdue Pete is not the official mascot of the university. Purdue University is a land-grant university (or Agricultural and Mechanical (A&M) university) created through the Morrill Act of 1862. In the 1890s, Purdue became a leader in the research of railway technology. For many years Purdue operated the "Schenectady No. 1", and later the "Schenectady No. 2", on a dynamometer in an engineering laboratory on the West Lafayette campus. These were 4-4-0 type steam locomotives manufactured by the Baldwin Locomotive Works of Philadelphia, Pennsylvania. The Schenectady was a classic Victorian-era design similar in construction to the Western and Atlantic Railroad No. 3 (see The General (locomotive) on display at the Southern Museum of Civil War and Locomotive History). Purdue even operated its own railroad to connect the campus powerplant to a main rail line. The American Railway Association Building, which stands on the West Lafayette campus to the southwest of the Mechanical Engineering Building, is one of the few remaining vestiges of the railroad testing which occurred on the campus. It was constructed in 1926 to test railroad car draft gears. In the 1930s the dynamometer was decommissioned and the Schenectady No. 2 was retired as the railroad industry in the United States converted from steam to diesel-electric locomotives. For many years Purdue did not have a mascot. In 1939, Purdue pharmacy student Israel Selkowitz suggested the school adopt an official mascot to represent Purdue's engineering heritage. He originally proposed a "mechanical man". After much debate, it was decided to build a locomotive on an automobile chassis. 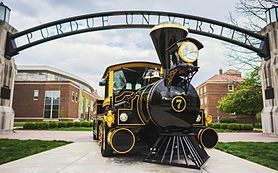 This choice allowed the mascot to build on Purdue's engineering and railroading heritage, as well as represent the school's nickname "Boilermakers" in a meaningful way. The "Boilermaker" nickname came about during the early years of Purdue football. There had been rumors the university enrolled burly boilermakers from the Monon Railroad shops in Lafayette, Indiana as students/football players to help beef up the scrawny football team after a 44-0 victory over Wabash College in 1891. When a railroad operated an extra train independent of the scheduled timetable, it was known as a "special". Thus, the trains which carried Purdue's sporting teams and their fans to other cities for athletic contests were known as "Boilermaker Specials". It was a perfect match. Financial support and encouragement to build the first Boilermaker Special were provided by key members of the Purdue University graduating class of 1907, and members of the Purdue Reamer Club from the graduating classes of 1940 and 1941. The Boilermaker Special I was introduced in 1940. The locomotive body was constructed by the Baldwin Locomotive Works and installed on a 1939 "Champion" automobile chassis donated by the Studebaker Corporation (South Bend, Indiana). The chassis had a 6-cylinder in-line gasoline engine and a three-speed manual transmission. The gearshift was on the steering column. The cab contained a single bench seat for the driver and one passenger. Although the coal tender area was not designed for passengers, one passenger could sit on top each of the wheel fenders. The cab had two sheetmetal doors, one on each side, each of which had a window. Although the cab had a windshield, the back only had a window opening with no glass. This meant the wind and weather would enter the cab from the back. The bell and the whistle on the boiler are believed to have been donated by the Monon Railroad shops in Lafayette. The whistle used exhaust from the engine as its source of compressed gas. Although the cab had marker lights, the only driving light was the single 'cyclops' light mounted high on the front of the boiler. Due to the high placement of the single headlight and a minimal number of other exterior lights, Boilermaker Special I was not driven at night for safety reasons. In honor of the Purdue students and alumni who contributed to the project, the numbers "074041" were later installed in the sides of the headlight. In 1953, the Boilermaker Special II was created by installing the original Baldwin body from the Boilermaker Special I on an International Harvester truck chassis. This meant that the Boilermaker Special II was visually identical to the Boilermaker Special I. A matching trailer was added during the 1950s to increase the passenger seating capacity. The trailer remained in use until the early 1990s. After the Boilermaker Special III was introduced, the Boilermaker Special II was scrapped in a Lafayette IN salvage yard. This was personally witnessed by Reamer Club member Roger Brunstrum so that no one could later claim they owned the mascot. In 1960, the Boilermaker Special III was introduced. It was built in Detroit by the General Motors Corporation on a 2-ton GMC school bus chassis. It was initially powered by a 6-cylinder gasoline engine connected to a two-speed manual transmission. A single rear axle with dual wheels and a manual-shift, two-speed differential rounded out the drive train. It also featured a pneumatic brake system, unlike its predecessors, which had hydraulic brakes. Boilermaker Special III featured an all-new body that was much larger and visually different than the Baldwin-manufactured body used on Boilermaker Specials I and II. The cab and coal tender were constructed of plywood with facings of sheet steel on each side. Forward of the cab, the body was heavy sheet steel and steel plate. The brass bell originally installed on Boilermaker Specials I and II was installed on the boiler. A new headlight was installed at the front of the boiler. It featured a small 12-volt bulb reflected by a large parabolic mirror. It was so bright it could only be used during parades. A locomotive air horn was installed on the top left side of the cab. When the horn was sounded, the Boilermaker Special III could be heard from miles away. To complete the locomotive theme, "steam" could be sprayed from the smokestack. The steam was actually carbon dioxide released by the driver from a fire extinguisher cylinder within the cab and plumbed to a nozzle just below the top of the smokestack. The body featured a full 12-volt electrical system powered by an alternator. It supplied power to concealed four-beam headlights, parking/marker lights, brake lights, backup lights, instrument lights, electric windshield wipers, a single-speed heater blower, and a radio/public address system. With this equipment, the Boilermaker Special III was capable of day or night operation on most improved roads, including highways. The original headlight from Boilermaker Special I was installed on the back of the coal tender as a rear-facing safety light. It was later removed and installed as the headlight of the Boilermaker IV in 1979 (see below). A white block P was displayed on the front of the boiler directly below the large front headlight. The location of the block P was actually a metal mesh screen which allowed external cool air to be drawn through the radiator by the engine's radiator fan. In the 1970s, the original engine and transmission were replaced with a carbureted Chevrolet 350 cubic inch V-8 and a three-speed automatic transmission. The two-speed differential was locked in high gear and shift mechanism removed. A power steering pump and steering assist cylinder were installed to reduce steering effort. In the early 1980s, a brass whistle was installed next to the brass bell and used the same source of compressed air as the large train horn. In this final configuration, the Boilermaker Special III weighed about 9,300 pounds (4,218 kg). When it was retired in 1993, it had traveled over 110,000 miles (177,027 km). In 1979, a small version of the Boilermaker Special was introduced. The Boilermaker Special IV, or "X-tra Special" as it became known, was built on an E-Z-GO electric golf cart chassis. This allowed the mascot to be displayed at indoor functions or on softer surfaces (i.e. a turf athletic field) where its massive gasoline-powered, and later diesel-powered big brother could never go. The headlight was the original headlight used on Boilermaker Special I and II. The top of the smokestack could be removed to allow the X-tra Special to fit inside freight elevators and move through standard height, side-by-side walk-through doors. The IV also featured a white block P on the front of the boiler directly below the headlight, just like the Boilermaker Special III. Boilermaker Special V was introduced on September 25, 1993. It was built on a Navistar Low-Profile 4600 chassis and powered by a non-turbocharged V-8 diesel engine. The Navistar chassis was donated by the Navistar International Corporation (formerly International Harvester). The body was primarily constructed of aluminum which was donated by Alcoa, which has an aluminum processing factory in Lafayette, Indiana. The aluminum body was fabricated and installed on the chassis by the Wabash National Corporation, also of Lafayette, Indiana. The brass bell from Boilermaker Special I and the brass whistle from Boilermaker Special III were installed on the boiler. A five-chime freight train horn from a Norfolk Southern locomotive was installed on the body. The coal tender was large enough to seat up to 14 passengers. The Special was able to "kneel", which allowed children and the elderly easier access to the coal tender. Despite the extensive use of aluminum in the body, the Boilermaker Special V weighed 10,800 pounds (4,900 kg), nearly 1,500 pounds (680 kg) more than the previous version. The Boilermaker Special V was the first to feature an Arabic number (in this case a "5") on the front of the boiler directly below the headlight. X-tra Special IV was later disassembled to make way for X-tra Special VI. Joe Peñaloza, a Purdue University graduate, designed the VI. It was built on a Club Car golf cart chassis, which was donated by Angel Hills Golf Course in Rossville, Indiana. The exterior body was made of a fiberglass composite, donated by Brunswick Tech. The structural work was done mainly at Wabash National. The fiberglass body was formed by Dr. Ray Thompson and his aviation composite materials class at the Purdue Airport. The paint was applied by West Coast Customs and donated by Valspar Corp. Pyramids Sign and Design completed all the detail paintwork. Many of the other materials used in the creation of VI were donated. These items include the brass, which was donated by ABC Metals Inc., bagging material was donated by Decomp, specialty foams donated by Diab, resin used before painting donated by Resin Services, and the lights and safety devices were donated by TSD. In 2011, the Boilermaker Special V underwent a significant overhaul with the help of the Wabash National corporation. With over 200,000 miles (321,868 km), it was in need of a new engine, transmission and chassis. In June 2011, the university confirmed the overhauled mascot would indeed be branded as Boilermaker Special VII, which is reflected by the number "7" displayed on the front of the train's boiler. The new design was made by Reamer Alumna Beth (Smart) Miller (F'06). The body was changed slightly to adjust to the new parts, as well as a slight change in the paint scheme. New whistles and bells were also installed, while retaining the original brass bell from Boilermaker Special I. Much to the delight of many Reamer Club Alumni, the Special is outfitted with modern LED lighting on both its running boards as well as its cyclops. Boilermaker Special VII was presented to the university on September 3, 2011 at halftime of the Middle Tennessee State-Purdue football game. It was dedicated on October 1, 2011 at a luncheon which preceded the Notre Dame-Purdue football game. On June 16, 2017, the Reamer Club announced the Boilermaker Special VI would be retired and replaced by the Boilermaker Special VIII. The VIII was assembled from a new, heavy-duty Caryall Turf 2 golf cart donated by Club Car and a new body designed and fabricated by the Wabash National corporation. The smokestack on the VIII is shorter than those on the IV and VI so that it no longer needs to be disassembled to drive into freight elevators or pass through doorways. The new X-tra Special made its first public appearance in West Lafayette Indiana at the Minnesota-Purdue football game with the boilermaker special VI the final appearance by the VI on October 7, 2017. It led the football team onto the field , and was later featured in an announcement at the stadium during the third media time-out of the first quarter. The Purdue All-American Marching Band also played a tribute to the Boilermaker Special during their pregame performance. The band formed an image of the X-Tra Special on the field, then played "Wabash Cannonball" as the formation moved across the field. The performance included band members discharging fire extinguishers at the top of the smokestack. A private dedication followed the football game at the Purdue Memorial Union. In attendance were active members of the Reamer Club, recent pledges, university advisors and honorary members, Wabash National employees, and Reamer Club alumni representing six decades of membership. Only a few small pieces of Boilermaker Specials I, II, III, and IV remain in existence. The majority of their bodies and chassis were scrapped when they were replaced, primarily to prevent any person or group from later claiming ownership of what was once the Boilermaker Special. The fate of Boilermaker Special VI has not yet been disclosed. The brass bell from the Boilermaker Special I is the same bell that was used on Boilermaker Specials II, III, and V. It is currently installed on Boilermaker Special VII. Pieces of sheetmetal from the Boilermaker Special I body containing the painted words "Purdue" and "Boilermaker Special" were saved when the body of Boilermaker II was scrapped in 1960 and remained on display in the Boilermaker Special garage for many years. The cyclops headlight from Boilermaker Special I was saved by the Reamer Club after it was removed from Boilermaker Special II in 1960. Photographs from the 1960s show it installed on the back of Boilermaker Special III. It was later installed on the front of Boilermaker Special IV in 1979. This headlight was not used Boilermaker Special VI or VIII and has been archived. Some parts of Boilermaker Special III were saved before it was scrapped. The locomotive headlight's parabolic reflector and trim were installed in a new headlight box and placed at the front of Boilermaker Special V. The single-flute steam whistle, which was installed in the 1980s, was transferred to the Boilermaker Special V as well. Sheetmetal bearing the painted words "Purdue" and "Boilermaker Special" were saved and archived. Finally, a heavy brass plaque, which was installed inside the cab above the windshield to commemorate the 1960 dedication of the Boilermaker Special III, was removed and archived. Although it is owned by Purdue University and the State of Indiana, the Boilermaker Special has been operated, maintained, and funded by the men and women of the Purdue Reamer Club since the mascot's introduction in 1940. The club's membership consists entirely of independent Purdue students (those who are not members of a social fraternity or sorority) who represent a wide cross-section of the student body. Within the Reamer Club, a Boilermaker Special Chairperson and a separate X-tra Special Chairperson are elected each semester to oversee the operation and maintenance of the mascots. Only men and women of the Reamer Club may serve as Pilots (engineers) or Co-pilots for the mascots after passing a rigorous training period. The Boilermaker Special is frequently seen around the main campus, at athletic contests, and at local community events where it is used to promote the university. From May through August, it can also be seen around the state of Indiana in various parades and festivals. It spreads school spirit by blowing its train whistle and horn. It also has an external sound system that plays family-friendly music. The members of the Purdue Reamer Club travel with the train to nearly every football game, including bowl games. During the football season, caps bearing the logos of defeated opponents are attached to the Boilermaker Special's cow-catcher. ^ "Mascots". Purdue Sports. Retrieved October 8, 2017. ^ Weliever, Alexandra (September 21, 2017). "The Boilermaker Special and the people behind Purdue's true mascot". The Exponent. Retrieved October 8, 2017. ^ "What is a Boilermaker?". Purdue Sports. May 17, 2018. ^ Miller, Travis (June 16, 2017). "Boilermaker Special VIII to Debut This Fall". Hammer and Rails. SBNation. Retrieved October 8, 2017. This page was last edited on 5 February 2019, at 21:03 (UTC).